A river cruise towards a warm welcome on the Flemish waters. Drop off the moorings and discover Flanders, a welcoming cross-border region of unexpected richness. 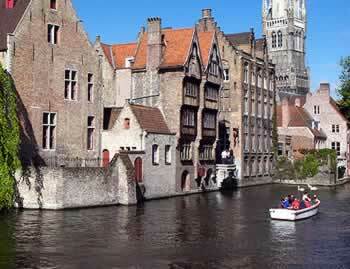 The waterways of Flanders form the most densely inland waterway network in Europe. There are picturesque canals, winding rivers and waterways for transportation. This network lends itself perfectly to circuits of several days for holidays by boat. A series of port cities will allow you to reach in a straight line the heart of cities important from the cultural and architectural point of view such as Bruges, Ghent, Kortrijk, Geraardsbergen, Brussels, Mons and Lille. Lovers of the nautical, maritime, gastronomic and historical inheritance will inevitably find their happiness on the waterways of Flanders. Also visit the regional park of canals and castles. Discover the rich natural heritage of the Yser valley, the Deûle, but also the Lys which has been and still is today the source of inspiration for good numbers of artists. In April and October all locks and bridges are closed on Sundays and public holidays. Cruises from Nieuwpoort are round-tripA river cruise towards a warm welcome on the Flemish waters.